Yellowjackets zeroing in on your steak and fruit salad as you dine al fresco can be irritating, but don’t get out the pesticide yet. “Yellowjackets have their place. Although they can be seen as pests due to their attraction to our food when we are dining outdoors, in typical scenarios they are beneficial insects, feeding on insects such as caterpillars that might otherwise damage your garden,” said Heather Stoven, a horticulturist with Oregon State University Extension Service. You’ll also see them bellying up to flowers to eat pollen, another behavior prompted by the dry conditions, and a big reason why Langellotto and Stoven urge caution if you use a pesticide. Certainly, caution should be taken around yellowjackets, especially if you find a nest in an area where you spend a lot of time. However, if a nest is in a location that is out of the way and unlikely to be encountered, the colony will be abandoned in the fall so these nest sites are best left alone. Before trying to treat the insects, consider some other methods to reduce their presence such as keeping garbage covered and fallen fruit picked up, Stoven said. Also, be careful around water spigots and water features, where they congregate during the hot days of summer. Using traps around dining areas can help keep yellowjackets away from specific areas, but not large areas. It’s easier to deal with these wasps if you know how they live. Yellowjackets are heavy-bodied, with black and yellow or white markings and live in gray, papery nests, which are mainly located below ground but some are suspended above. Worker yellowjackets hunt for insects, carrion or rotting fruit to carry back to the nest to feed their nest-mates. If you accidentally come close to or contact a nest entrance, you’re likely to get stung. Workers vigorously defend the nest and queen. Their sting is more painful than honey bees and normally no stinger remains in the skin. A single yellowjacket may sting more than once. A queen is the epicenter of each nest and her sole responsibility is to lay eggs. She begins a nest in the spring by laying a few eggs and raising the adults. Workers provision, expand and defend the nest. As spring and summer pass, the nest grows and new workers assume their role. By the end of summer, nests may contain hundreds or thousands of workers. By August or September, their population is at its highest. By fall, yellowjacket nests have produced a crop of new queens and males. By the first frost, most workers and queens leave the nest to find a protected spot to spend the winter. They emerge in spring to begin the cycle again. Only new queens survive the winter, however, and they almost never reuse the previous year’s nest. If you feel you have no choice but to destroy a yellowjacket nest, you must first locate its entrance, said Langellotto. Wear protective gear that covers your skin, and carefully mark the nest entrance. This will help you to find and treat the nest on a cool night, when workers are inside and relatively calm. Use an insecticide that is labelled for yellowjacket control, and follow all directions for use. A quick-acting, knockdown pesticide should be used, to keep yellowjackets from flying out of the nest. Do not use a flashlight when treating a yellowjacket nest at night. The wasps are attracted to light. Don’t pour petroleum products into ground nests. It is dangerous, environmentally harmful and illegal. Use products specifically made for yellowjacket control only. Be sure to read and follow the pesticide product label. Remember, the label is the law. 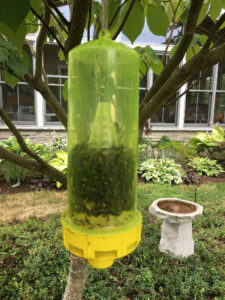 Non-toxic yellowjacket traps are available in yard and garden stores. The most effective use a synthetic attractant to lure worker yellowjackets into the trap. Fruit juice or meat can be used as attractants as well. Traps may provide temporary relief by drawing workers away from people, but they are not effective for area-wide nest control. A yellowjacket trap can be affective for small areas, but they fill up fast. This one has been up for four days. 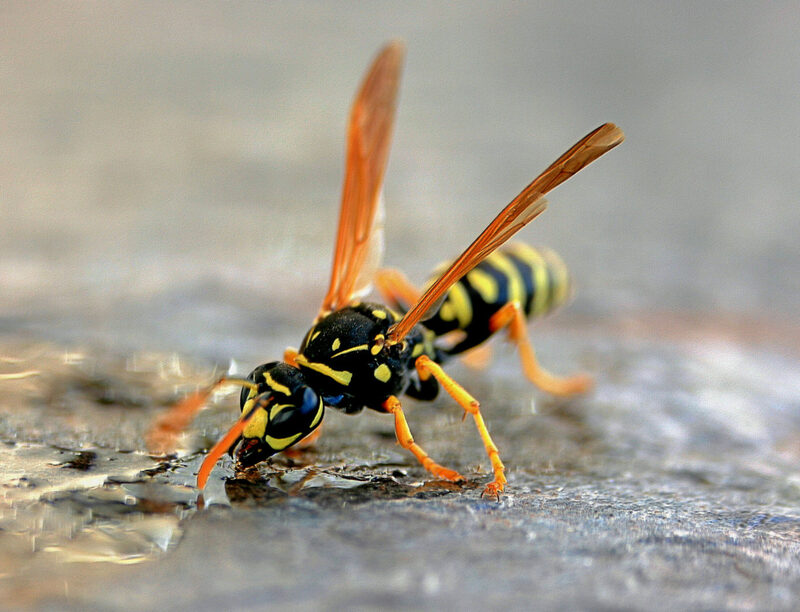 Persons particularly sensitive to yellowjacket venom should be extra cautious in late summer and early fall, when the insects are most numerous. Enlist the help of someone not as sensitive, if you need to spray a nest. Other wasps are mud daubers and paper wasps. Mud daubers collect bits of wet soil to take back to their nests, usually a mud tube. Paper wasps build small, open nests that are suspended vertically from a horizontal surface, such as under an eave, bush or tree branch. Their long legs and thin “waists” distinguish paper wasps. Both mud daubers and paper wasps are less aggressive and normally will not sting or swarm when away from their nest.